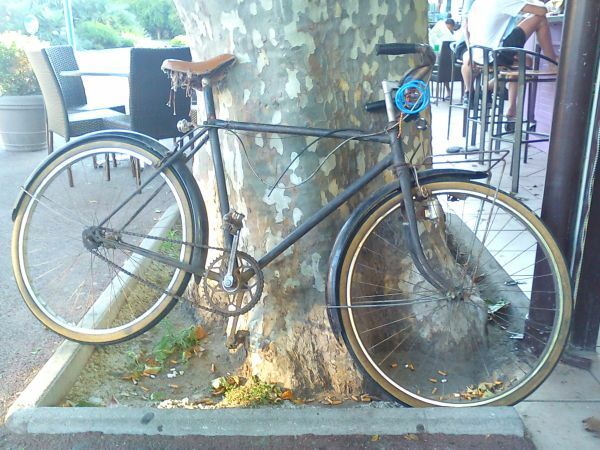 For two weeks the bicycle leaned against the tree outside Cafe Disparaît. Then one day its front wheel was gone, and the next, its saddle. Tipped forward onto its front forks, the bike stared at the ground, waiting. Above it was a sun-bleached poster of a cyclist. Eventually a waiter, irritated from catching his apron on the bike’s handlebars, mentioned it to a Gendarme eating croque monsieur in the shade of the restaurant’s awning. A week later he came by with pair of bolt cutters and threw the bicycle into the back of his van. The poster had torn and flopped forward, only the word PERDUE* could still be seen. This is part of the Friday Fictioneers writing group – where writers from all over write about 100 words using a photo as inspiration. This week the photo has been provided by anelephantcant. Click here to read other people’s and to join in. For those of you who’ve read my pieces before and know I’ve been writing a novel, you might be interested to hear that Our Endless Numbered Days just been bought by Fig Tree / Penguin in the UK and has also been bought by publishers in several other countries. Naturally I’m absolutely delighted. It will be published in early 2015. If you’re interested there is a bit more information here from The Bookseller. A moving little tale – well done Claire. And congratulations on your publishing success! That’s exciting about your book – yeah we need to have a party for you! Sheesh, this piece was sad and moving. Huge congrats on your book too! Thanks Trudy. I’m very excited. How’s yours coming along? Wow! Powerfully sad imagery. What a memorial to the missing man. Great job! Well imagined, Claire. And congratulations on your book! That’s so exciting. Thanks Linda, glad you liked it. Congratulations Claire. You have made it to the big time. I like all the details in this. Such good work. Thanks Joe. I don’t know about that, but I’m certainly a few steps further down the path. This is a terrific flash. Congratulations on the publishing deal!! Thanks Honie. Glad you liked it. I’d love a croque monsieur right about now, too. Very cosmopolitan flair to your lovely little story and I add my congratulations to all the others. What thrilling news! I add my hearty congatulations to the others. I enjoyed your bike story. Nice visual and atmosphere. Thanks Rochelle, and good luck with yours. Maybe if you don’t want your bike to be dismembered you should not park it in front of café Disparait! Congratulations on the book! Yes, it’s a dangerous place! Thanks for the congratulations. Yeh! One sale already 😉 Thanks for your comments on my story. Enjoyed this flash. Glad I wasn’t eating the croque monsieur. Happily vegetarian. Congrats on the book being published. I didn’t know that several publishers could buy a manuscript. Publishers buy rights to regions around the world, so you might have a publisher which buys world rights, or split it up into regions. This was SO good, darling. That ending made my heart sink. Congratulations on being published! Thanks Helena. Poor cyclist. Where is he now? Pingback: Dyke on a Bike – Friday Fictioneers | Being the Memoirs of Helena Hann-Basquiat, Dilettante. Fantastic flash! The ending was an extra twist for me. I read it again and saw how cleverly it all fitted together. Sad. Congratulations on your book too! Good luck with that! Excellent, Claire! I felt So sorry for that bike. And congrats on your book, too! So poignant…everyone obsessed with their own lives and needs, and overlooking the point–the missing cyclist. Congratulations on the book deal–well done! Sad and evocative tale, unless the poster was an advertisement for chicken. Good luck with the novel! A sad story, wonderfully written. And congratulations as well! I really enjoyed how you had the waiter catching himself on the handlebars. Great use of the prompt. My first time here, but I will waste no time in offering my congratulations on your publishing success! Awesome news! And your story is equally as awesome!